Sage has been around a long time. This nutritious evergreen plant is from the mint family and is native to the Mediterranean region. Sage has grayish leaves, woody stems, and blue to purplish flowers. 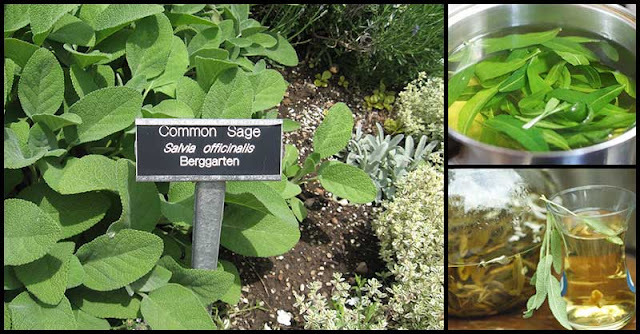 The Latin name for sage was formed from “salvare,” which literally means to heal. Native Americans and other indigenous cultures have been using sage to stimulate healing, purify the environment, and increases the ability to learn something. Aside from all of these, sage also contains volatile oils, phenolic acids (like rosmarinic acid), and flavonoid (like luteolin, apigenin, and diosmetin). Alzheimer’s disease (AD) affects memory and brain function. It gets worse over time. Fortunately, sage is rich in vitamin K, which is needed by the brain and neuronal health. Results of a study showed that people with Alzheimer’s disease have benefited from using sage as a treatment for four months. Vitamin K encourages cognitive activity, and prevent brain oxidation, thereby delaying or even preventing the onset of Alzheimer’s disease. According to studies, sage leaf extract has anti-hyperglycemic properties which can help block the release of stored glucose from the liver, thereby lowering blood glucose levels. This can be helpful for people with type 2 diabetes. Vitamin K reduces urinary excretion of calcium, improves calcium absorption, and acts as a modifier of bone matrix proteins. One tablespoon of sage contains 43 percent of vitamin K.
Sage is a great stimulant tonic that can treat stomach weakness and problems. Simply drink sage tea as it can remove symptoms of indigestion by stimulating upper digestive secretions, pancreatic function, bile flow, and intestinal mobility. If you are suffering from inflamed throat and tonsils or ulcerated throat, then sage infusion can give some help. Do this by boiling a pinch of dried sage leaves in about 100 ml of water and infuse for 15 minutes. Strain the concoction and let it cool down. You can add some honey to sweeten it and then gargle it twice a day. Due to its magnesium content, sage can help improve the quality of sleep, reduce sleep problems like insomnia, and regulate the metabolism. According to research conducted at the University of Vienna, Austria, sage has volatile compounds that have anti-inflammatory effects on certain bodily ailments. Some of the compounds present are 1,8-cineole, borneol, camphor, and thujone. In women, menopause occurs between the age of 45 to 50 years of age. It is a period in women’s life wherein menstruation stops. Sage has been traditionally used in treating menopause and its symptoms. Due to its anti-spasmodic effect, sage can help lower muscle tension and be used for steam inhalation to prevent asthma attacks. It removes mucous congestion in the airways.